Car Video Recorder PRESTIGIO RoadRunner 510 (1920x1080 Video, 2.7" Display, USB2.0/HDMI/A/V) Black - BEIDZOT.LV ...viens kārtīgs veikals! 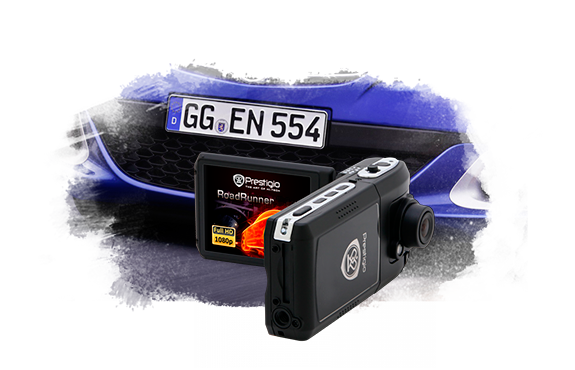 The multifunctional Prestigio RoadRunner 510 is a car video recorder that provides real Full HD quality video. 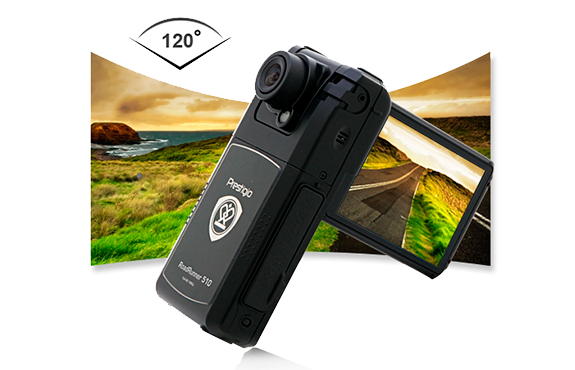 Rotatable in 270 degrees 2.7 inch TFT LCD display and in 180 degrees rotatable lens (with 120 degrees viewing angle) gives you additional possibilities to use wherever you go or drive. With the various picture settings and the long battery life you will have the opportunity to use the RoadRunner 510 as a portable or photo camera. 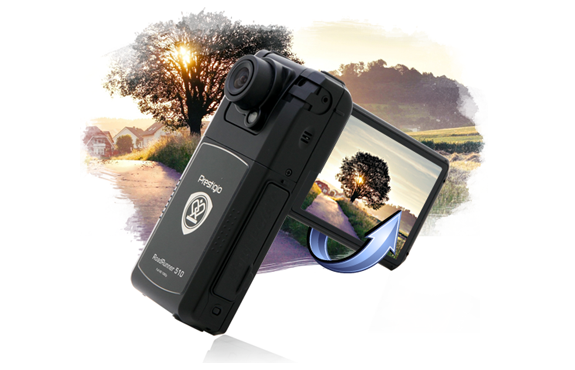 The Prestigio Road Runner 510 compact body design resembles a digital camera. The controls are conveniently located on the side of the unit. An adjustable swivel 2.7-inch display lets you comfortably view videos and photos and it is easy to configure the DVR. In addition, the display allows you to determine which objects are captured. The RoadRunner 510 is one of the best representatives of a Full HD DVR. Hidden beneath its compact body is a reliable video surveillance system with broad functionality, excellent video quality and superior performance. Universality, ease of use and multifunctionality ensures that the RoadRunner 510 takes a leading position in the market. One of the main advantages of the Roadrunner 510 is the video recording function in high Full HD quality, with a resolution of 1920x1080. Recording speed is 30 frames per second, which is optimal for the perception of moving objects for the human eye. Format video recording is AVI/H.264. The files are in H.264 format so are compact in size, so you can use the free space on the memory card as efficiently as possible. Another advantage of the RoadRunner 510 is its 12Mpx camera. The clever design of the device allows you to rotate the camera 180° so you can point the camera to the appropriate section of the road as you require. The RoadRunner 510 can also be used as a digital camera and the size of the photos can be adjusted up to 12Mpx. The RoadRunner 510 has broad functionality. The device is equipped with a motion sensor function so the DVR will start recording as soon as the sensor detects any movement in the frame, which means you will have automatic video protection without the need for driver interaction. 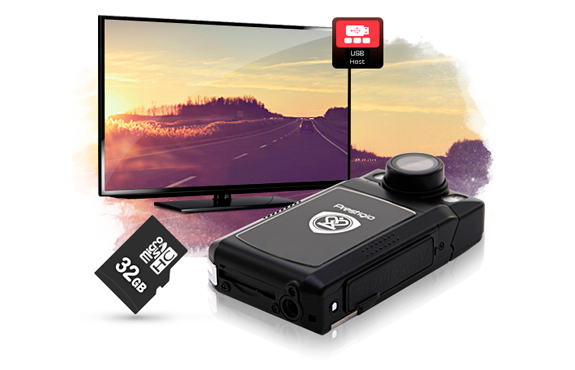 As with all Prestigio DVRs, the RoadRunner 510 supports cyclic recording video so when the memory card runs out of space, the new files are saved on the site of the oldest, allowing you to use the DVR effectively, completely eliminating any data loss. The Roadrunner 510 is equipped with HDMI-output for connection to a digital monitor, TV or home theatre system and a USB 2.0 output for connection to a PC or laptop for quick data transfer. The RoadRunner 510 supports SD memory cards up to 32 GB. The recorder operates on a built-in Li-Ion rechargeable battery or DV 5V output Car Charger, so no matter how far you drive the device is always on your guard. PRESTIGIO Car Video Recorder RoadRunner 500 (2.0",1920x1080,A/V/HDMI/USB2.0) Black Silver Retail. PRESTIGIO Car Video Recorder RoadRunner HD1 (2.5",1280x720,USB2.0/A/V-Out) Black Retail.